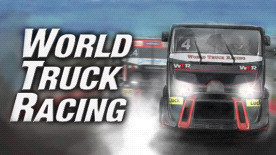 Enter the world of Truck Racing in a new arcade-racing game. Sit behind the wheel of monsters with over 4000 hp engines allowing them to accelerate just as fast as supercars. Test your skills in close-contact sport. Drive fast and find your way between opponent cars to the first place. Adjust your car's settings to achieve handling and performance fitted to one of 16 racetracks around the world.